Dekan Grotto, Knights of Columbus, Great War Veterans, Y.M.C.A. Saskatoon Quakers, second half champions, beat the first half winner Winnipeg Maroons in a best-of-nine playoff to take the 1919 Western Canada title. With a .315 average, Arthur Henning of the Maroons won the batting crown. Spencer Heath, also of Winnipeg, won the most games, 18. The elusive Lafayette Henion (right) of Moose Jaw found himself pitching in the major leagues at the end of the season. After one appearance in a regular season game and one in an exhibition game it was back to the minor leagues. Three players - pitcher Spencer Heath of Winnipeg, Wally Hood of Moose Jaw and Bernie Neis of Saskatoon were in the majors the following season. Frank Brazill of the Maroons and Ralph Miller of Regina made big league rosters in 1921 and Rube Lutzke (left) of Winnipeg made his mark in 1925. Norm Glockson of Regina had played a few games in the majors in 1914. June 11 Red Donovan of Saskatoon provided one of the year's highlights in firing a no-hitter as the Quakers blanked Regina Senators 9-0. Donovan, just out of sick bay, was helped by outstanding defensive work by Bernie Neis who received applause from the crowd for his play. Quakers pounded Dan Collins, on the hill for Regina, for 14 hits. Item in the Medicine Hat News, October 2, 1919, after the Medicine Hat Mowaks had upset the Calgary Hillhurst Hustlers for the Alberta baseball championship. During the Hustlers' series against the Edmonton Veterans, the ball players had an opportunity to meet royalty. 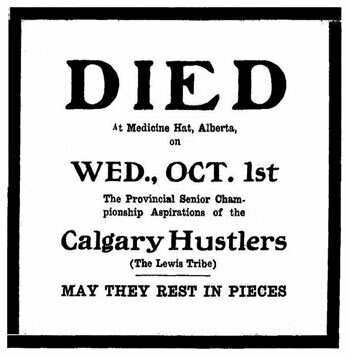 While in Edmonton, the Calgary Hustlers had the honour of greeting the Prince of Wales (later Edward VIII). Andy Baxter is the player in conversation with the royal visitor. At the left of the photo is Dodger Lewis the Hustler's catcher. Next to Lewis is team president H.A. MacDonald. Peeking over MacDonald's shoulder is first baseman Joe Carnegie. Russ Gibson, the third baseman, is standing next to the prince. Just behind Gibson is Charlie Huffman, centre fielder. 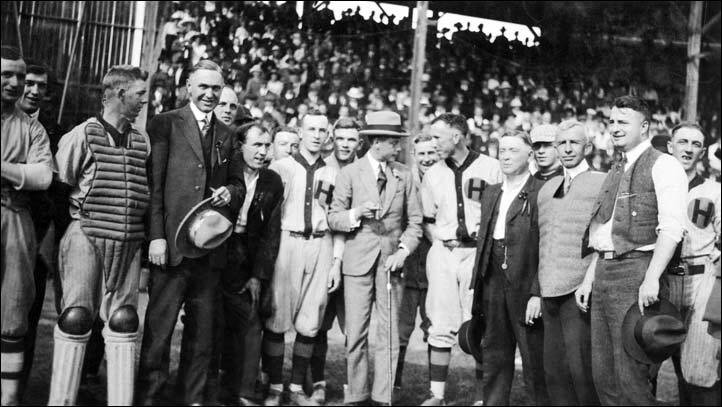 Stiffy Lewis, pitcher, is seen between Gibson and the prince. Freddy Lepper's face can be seen between the prince and Baxter. Next to Baxter is club secretary J.A. Barkley. Umpire Julie Streib is wearing the chest protector and behind him is outfielder Scotty Mitchell. F.H. McPherson of the Alberta Amateur Union, is alongside Streib.